Have you ever wondered what's going on with the smokestack behind the HOP? It's our campus heating plant, where Dartmouth burns No. 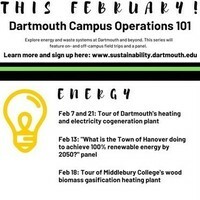 6 fuel oil to generate steam (which heats all of campus) and electricity (which provides a portion of Dartmouth's electricity). Sign up here to tour the plant!